Edward E. "Eddie" Jerrell, 89, of Solsberry passed away Wednesday, August 1, 2018 at IU Health Bloomington Hospital. Born, February 3, 1929 in Petersburg, Indiana, he was the son of George and Delma (Beard) Jerrell. Eddie was an Auto Mechanic at Indiana University for many years servicing all IU fleet vehicles. He was also the Service Manager at Paul Brown Motors in Bloomington. 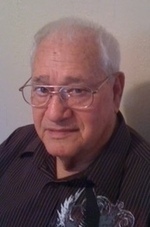 He was a loving father, and grandfather who enjoyed horseback riding, attending The Old Country Church in Bloomfield, and spending time with his family. Survivors include his daughter, Vicki Egan (Rocky), three grandchildren, Bradley Egan (Kristine), Brian Egan, and Jeremy Jerrell all of Bloomington, five great-grandchildren, Joshua Egan (Mercedes) of West Virginia, Jordan Egan of Bloomington, Briana Egan of Indianapolis, Brice Dillman of Ellettsville, and Julianne Egan of Bloomington, three great great-grandchildren, Lainey Egan, Knox Egan of West Virginia, and Maverick Hughes of Indianapolis, sister, Norma Davis of Seymour, sister-in-law, Laura Jerrell of Louisiana, and several nieces and nephews. Eddie was preceded in death by his parents, son, Jeffery Jerrell, brother, Arvil Jerrell, sisters and brothers-in-law, Catherine Willis (Wayne), and Velma Hamm (Melvin "Bud"), and Elwood Davis. Visitation will be 11am-1pm Tuesday, August 7, 2018 at The Funeral Chapel of Powell and Deckard, 3000 E. Third St. in Bloomington. Funeral services will be 1:00pm Tuesday at The Funeral Chapel with Pastor Jerry Gholson officiating. Burial will follow at Valhalla Memory Gardens in Bloomington. Memorial contribution may be made to The Funeral Chapel.